Tweed is the generic name for a very wide variety of stubbly coarse woollen cloths. Typically of multi coloured carded yarns and twill construction. 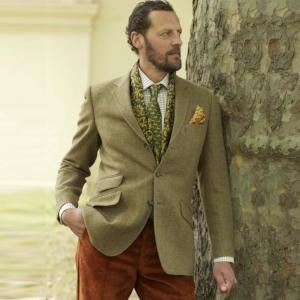 Tweed clothing is a popular form of leisure wear, it can be tailored into suits or coats used for hunting, coarsing or other equestrian and outdoor activities. In a lighter weight, tweed is also used for dresses. Tweeds are an icon of traditional Irish and British country clothing, being desirable for informal outerwear, due to the material being moisture-resistant and durable,are commonly worn for outdoor activities such as shooting and hunting, in both Ireland and the United Kingdom. Tweeds are made to withstand harsh climate which explains again the reason why the suiting fabric is so popular for outdoor activities. 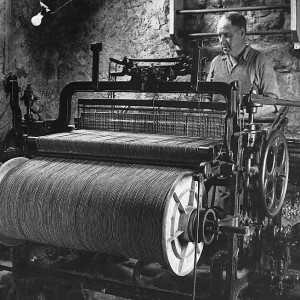 The weaving of Tweed began quietly, passed down amongst families on the Scottish Isles of Lewis, Harris, Uist, and Barra for generations. During the harsh winters on the isles, Harris Tweed was one of the few fabrics thick enough to protect someone from freezing to death and so it wasn't long before those families realized they might have be able to make a little money out of their craft. Pretty soonTweed was being traded at markets throughout Scotland, so much in demand that at one point it was actually used as flat out currency. A famous tale even attributes the fabric's very name to a British trader who, in 1830, became intrigued by this mysterious new material from the Scottish isles. In a letter he accidentally misspelled tweel (the Scottish name of twill) as tweed, a happy accident that had a nice ring to it and stuck. Others say that Tweed and its name originated along the similar named river Tweed; the river that separates England from Scotland. Tweed was beginning to take the attention of the London gentry, who discovered it on their shooting and fishing trips up north. 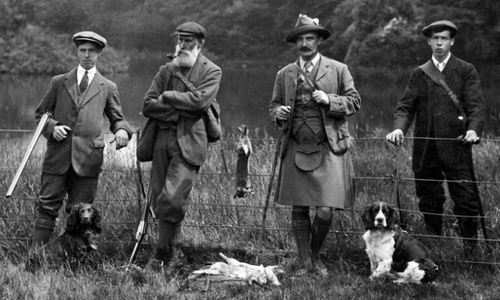 Tweed clothing eventually became tweeds, an important element of leisure wear. While the fabric's reputation was slowly building, it was Lady Dunmore, the widow of the landowner of Harris, who really pushed it into the spotlight in 1864. Lady Dunmore decided to have Harris weavers redo her clan's tartan in the region's trademark tweed, an act that prove so successful it propelled Harris Tweed into a full-blown industry. Over the next few decades Harris Tweed's popularity grew, so much so that by the turn of the twentieth century, knock-off artists began popping up across Europe. 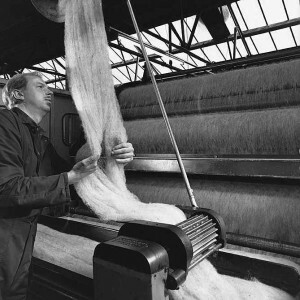 Harris Tweed has a very specific production process which includes dyeing of yarns in vegetable oils before the fabric is woven, giving the tweed it's unique color-schemes. 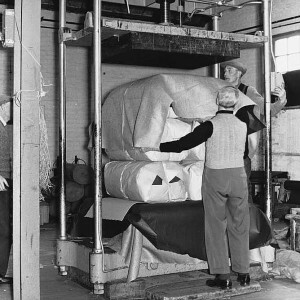 To ensure this specific practice remained protected, the Isle's weavers joined together in 1906 to create The Harris Tweed Association, a group designed to authenticate genuine Harris Tweed and stamp it with the trademarked orb and cross logo. With this in place the allure of and desire for Harris Tweed only grew, becoming a crucial part of any winter wardrobe in Europe and the states alike. While at first the fabric was used for hunting jackets and shooting bags — as it the dense weave was both warm and practically waterproof — it eventually moved from the forests to the cities, becoming a favorite of businessmen and moody creatives alike. The flecked tones of Harris Tweed have now become a cornerstone of the cold, with muted tones that blend together into bold patterns that fit right into the swirling colors of fall. Truth be told, it's impossible to find a more seasonally appropriate fabric. The proliferation of Harris Tweed has continued through to today as everyone from J. Crew to Paul Stuart to Savile Row tailors, and even Nike, have used the fabric in their collections. The flecked tones of Harris Tweed have now become a cornerstone of the cold, with muted tones that blend together into bold patterns that fit right into the swirling colors of fall. Truth be told, it's impossible to find a more seasonally appropriate fabric for autumn and winter. It is also true that the fabric has more than a whiff of old-school style, but, worn wisely, tweed hits that sartorial sweet spot between classic and contemporary. In a nutshell, it’s one of menswear’s certified all-rounders, it works just as well in the form of a blazer worn with a button-down and jeans, as in the shape of a three-piece suit. The fibre of Tweed is often wool, but it can also contain cotton, rayon, silk, linen and synthetics. Tweed can be compared with Cheviot and Shetland. They are the same in texture, yarn, weight, feel and use. Originally only made from different coloured stock-dyed fibres, producing various colour effects. Tweeds come in a wide range of rough surfaced, sturdy fabrics. Still there are also some closely woven smoother, sturdy fabrics and many monotone tweeds. Tweed comes in different variations like plaid, checked, striped, herringbone or other patterns. Irish Tweeds tend to be more colourful with large patterns, whereas Scottish Tweed patterns tend towards the very small. The most famous Tweed is Harris Tweed, usually Tweed from the Isle of Harris. This can be checked if it has the famous Orb Mark of the Harris Tweed Association. Harris Tweed can be very bulky, because it is used for hard country wear. Shetland is much softer and finer: with a loose texture, it creates sports clothing of character, though less endurance.